Hey there! Registration for the Stargazer Block of the Month is now open! The Stargazer BOM program features new modern triangles block of the month planned for 2019. It features lots of geometric shapes and patterns and pretty, playful colors. Complete details can be found on the registration page. But below you’ll find a listing of a few FAQs. How long will the BOM run? Programming for the BOM will run for 9 months. It will run from mid-January to mid-September with a few extras coming after the quilt top. A chance to post your progress and see other’s pictures in the private facebook group. The style will be a modern triangle block of the month program a la the Rainbow Triangles 2018 BOM and the Modern Triangle Medallion of 2017. I’m just not finished with the triangles yet! 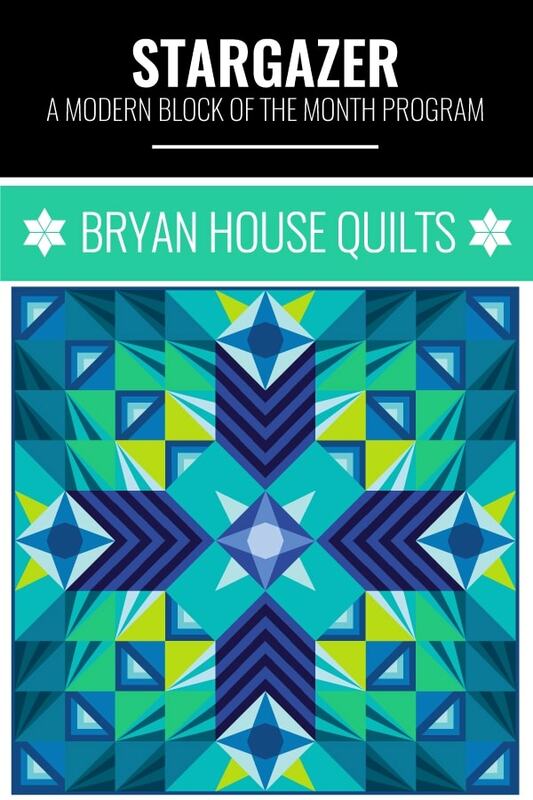 This year will feature a mix of triangles from Modern Triangle Quilts and new Triangle blocks. Yah new triangle blocks! Materials Lists will be posted December 14th. You will need a copy of Modern Triangle Quilts. There are size options for an 80” x 80” monster quilt, a 60′ x 60” throw quilt, and 40” x 40” baby-mini quilt. I’m thinking there might be a chance for a nice pillow size too! I’ll be working on a cool, blue version similar to the one’s above. I’ll also be showing a few different color ways with yardage requirements. There will also be a Yardage Calculation Sheet coming in December, for you to completely color your own. Why a Block of the Month? A block of the month, or BOM, is a great way to work through a complex pattern together. This time next year, you could be finishing up your Stargazer quilt! Think of that! You can preview the format by checking out my 2018 BOM here.